Channel 4 has said The Great British Bake Off will feel more "modern and future facing" when it swaps channels after moving from BBC One this year. Channel 4's Jay Hunt said: "This is Bake Off but with an extraordinary, high calibre of contributors and it's got a slight Channel 4 feel to it. "We've got a new tone to it, it's got a new comic riff to it. I think that feels modern and future facing. "I think it's a show that people will love with a Channel 4 spin." The new series, which will be broadcast later this year, will be the first to be shown by Channel 4 after the broadcaster won the rights from the BBC. Paul Hollywood is the only original member of the Bake Off line-up following the show to its new home. He will be judging the contestants' baking skills with Prue Leith, while comedians Sandi Toksvig and Noel Fielding are taking over as hosts from Mel Giedroyc and Sue Perkins. Ms Hunt, who is Channel 4's chief creative officer, said she was "quietly confident" about the series having seen the first episode. She also denied reports that relationships between the new team had soured. "I was in the tent a few weeks ago for the whole day. I was struck by completely the opposite," she said. "Chemistry is hard to achieve on television and the thing that I took away from it more than anything else is that there was natural warmth and that they got on really well and their humour worked incredibly effectively together." Hunt, who announced last month that she would be leaving her post in September after more than six years, added: "Their chemistry is fantastic, the calibre of the baking is absolutely jaw dropping... I can reassure all the sceptics that it's looking absolutely fantastic." A clip from the first instalment of the programme was shown to the media on Wednesday as Channel 4 unveiled its annual report. It showed Fielding telling the bakers that he has to "deliver the bad news" that one of them has to leave, adding that it is a "horrible job". 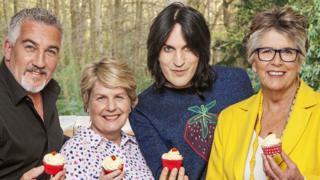 Why did The Great British Bake Off move to Channel 4?